The Gift that gives all year Round! We’re outdoorsy people, so nothing makes me happier than being in the warm sun, with my favourite boys, enjoying an activity all together. 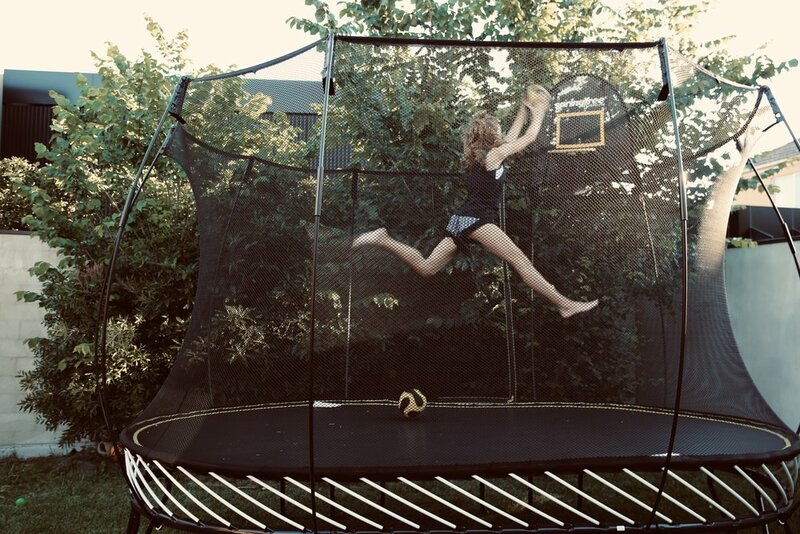 Our Springfree trampoline (model: Large Oval) has easily become our household’s most popular ‘toy’ since it’s arrival in July. The PS4, tablet and action figurines have all be bumped down the pecking order, and (just quietly) I couldn’t be happier about it! Our toddler has declared the trampoline his new play pen. In any weather (minus heavy downpour like tonight!) he’s outside jumping, rolling, plane watching and singing in his happy place. It’s also the first spot my older boys race to after school - even before emptying the fridge! For them it’s all about the basketball ring - FlexaHoop. To say they’re obsessed is an understatement. They spend hours out there perfecting their mid air jump shot, bouncing intercepts and airtime dunks. Their skill acquisition (and confidence) has grown immensely over the 5 short months they’ve been jumping. Tomasi’s even earned the nickname “the master” because of his uncanny ability to find the back of the net from anywhere! David, a big kid at heart, transforms into a Harlem Globetrotter the moment he steps onto the Softedge mat. Safety is not an issue, given there are no metal rods or springs …so he doesn’t hold back! The netted walls cushion jumpers, whilst the jumping surface has been engineered to be 30 times more shock absorbent than traditional pads. Us 80’s kids did it tough! With Christmas just around the corner, a Springfree Trampoline is the perfect gift for the entire family to enjoy. Parents can have peace of mind knowing the innovative design is the world’s safest, highest quality and longest lasting trampoline backed by a full 10-year warranty. Scroll down for our special BLACK FRIDAY OFFER ! Or Click HERE to browse the full range of Springfree Trampolines. There are loads of play enhancing accessories available too! Perfect to suggest to Aunts, Uncles and Grandparents as gift ideas this Christmas. My favourites include the FlexrHoop, Sunsmart Shade (filtering 99% of UVA and UVB rays) and Tgoma. Buy separately or in value bundles. Springfree is the World’s Safest Trampoline backed by a full 10-year warranty and is the only CHOICE® recommended trampoline, being the only trampoline out of 8 leading market brands to pass all Australian safety standards as tested by CHOICE®. Stakes Day 2018 ~ All the best bits!